The ignition must be switched ON to use the turn and lane-change signals. If the indicator light continues to fl ash after a turn, manually return the lever to its original position. The direction indicators (green) in the instrument cluster fl ash according to the operation of the direction indicator lever to show which signal is working. If an indicator light stays on without fl ashing or if it fl ashes abnormally, one of the direction indicator bulbs may be burned out. 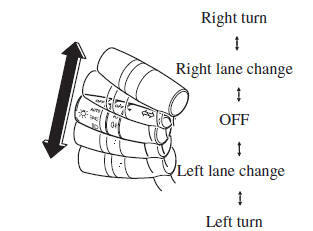 Move the lever halfway toward the direction of the lane change—until the indicator fl ashes— and hold it there. It will return to the off position when released. To signal a lane change, operate the direction indicator lever up or down slightly and release. After releasing the lever, the direction indicator fl ashes three times. The three-fl ash turn signal function can be switched to operable/inoperable using the personalisation function.